Aircraft Aboard Uss George Washington, Execute A Formation Fly-by Above The Aircraft Carrier. An F-14 Tomcat Launches From The Flight Deck As The Aircraft Carrier Steams Through The Mediterranean Sea. Sailors Aboard The Aircraft Carrier Uss George Washington (cvn 73) Man Their Sea And Anchor Stations As Tugs Help Push Them Away From The Pier To Begin A Regularly Scheduled Deployment In Support Of The Global War On Terrorism. The Nuclear Powered Aircraft Carrier Uss Enterprise (cvn 65), Fast Combat Support Ship Uss Detroit (aoe 4), And The Guided Missile Cruiser Uss Gettysburg (cg 64) Perform A Replenishment At Sea. Equipment And Supplies Sit Staged Aboard The Fast Combat Support Ship Uss Detroit (aoe 4), In Preparation For Transfer To The Nuclear Powered Aircraft Carrier Uss Enterprise (cvn 65). The Nuclear Powered Aircraft Carrier Uss Harry S. Truman (cvn 75) Conducts A Refueling At Sea (ras) With The Military Sealift Command (msc) Fast Combat Support Ship Usns Arctic (t-aoe 8). 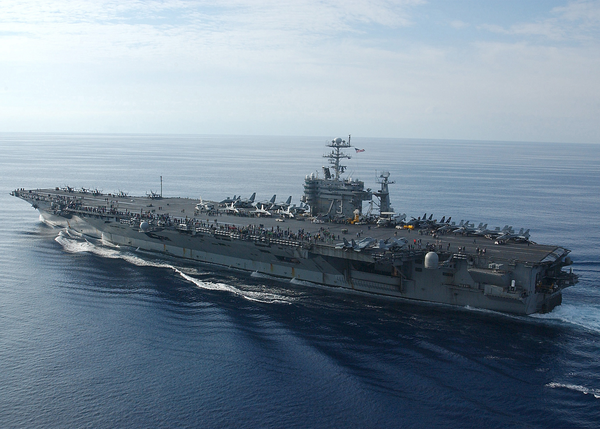 Uss George Washington (cvn 73) At Sea. U.s. Navy Ships Conducting A Replenishment At Sea Operation.